I love this topic, because my husband is a veteran Production Sound Mixer and has written on the topic. He teaches Production Sound at New York Film Academy, in Burbank. In fact, we first met when he was the Boom Operator on my first film in Los Angeles, when I was the On-Set Dresser. Every scene in film or television will be made up of numerous audio elements all harmoniously layered together. These include dialogue, room tone, foley, sound effects, and score. The effects could be several layers of sound, creating a sense of nearness and distance. Sounds and the score affect and direct the emotions even more than the visuals. The Sound Department is made up of two parts – Production and Post-Production. The Production team is led by the Sound Mixer who captures the actors’ vocal performances, by recording dialogue – or just the sounds they might be making in a quiet scene. The idea is to capture as clean a track as possible so that the post people have excellent quality sound to work with – and that sparkles with the nuance of the performance in the moment. The Mixer also records room tone in each set, and occasionally grabs background sounds if the location happens to be noisy. These sounds can be mixed again in post into the final soundscape. Sometimes the Sound Designer will request these recordings, but more often an astute Mixer just notices that it would be a good idea to capture this. The Mixer determines the best method and mic for the needs of the scene and the shot. Many decisions will have been made in the production meetings during pre-production. Choices about when to use wireless mics, plant mics, or a boom, will be the subject of discussion, and sometimes collaboration with set decorators and costume designers. Mixers need to have a strong awareness of new recording technology including microphone types, mixers, headphones, and recorders. For a hilarious, if exaggerated, take on what can go wrong, please watch Singin’ In the Rain (1952). Oh, those pearls! The Sound Mixer also manages the Smart Slate, ensuring that all the takes have the same time code numbering, and handles the paperwork – sound logs/reports and timecards for the team. 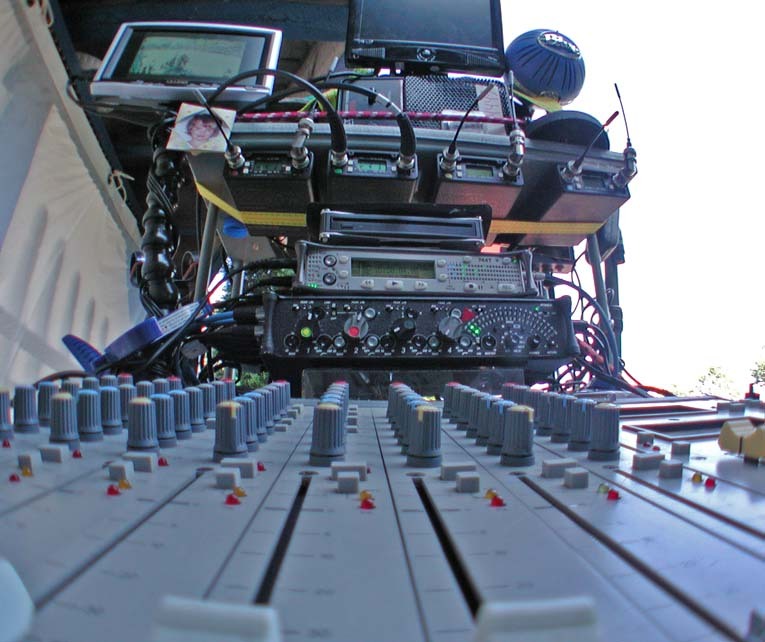 The Mixer provides headsets for the Director, Script Supervisor, and any VIP’s visiting in the “video village”, which allows them to hear the dialogue as the mixer hears it. See Notting Hill (1999) for an example of that. The Mixer is aided by the Boom Operator, who places the microphone/s and works dynamically to capture the spoken dialogue, while avoiding casting shadows. The Boom Operator should be strong and have stamina, as well as a good understanding of the fundamentals of sound mixing. They listen through headphones for sound quality too and will be the first person to be aware of a problem with the take. They should understand camera lenses and framing, and learn the script. The third person in the department is the Utility person, sometimes called a cable runner. This is the entry level person. Their job is to manage the cable that runs to the boom pole, assist with set up and moving of the sound cart, tidy cables, run errands on behalf of the department, and on occasion, be a second boom operator. Usually the utility sound person is someone with aspirations to becoming a Mixer in due course. The final person involved with Production Sound could be a playback person. The Sound Mixer and team could set up music playback for situations when it is needed, but on a big musical, this might be outsourced to a separate individual, just to make things more efficient. Production Sound people need to be good communicators, love hi-tech, have good aural acuity, and strong attention to detail. They have to able to screen out distractions and focus. This department can get very large. While there is usually only one Production Sound Mixer during principle photography (rarely a second one for second unit work), there are numerous opportunities for mixers and other technicians in Post. In terms of employment opportunities, being an expert in post sound could be advantageous by comparison. The Sound Designer, like every other person who has to make a decision, starts by analyzing and breaking down the script. They need not only creativity, but attention to detail and good communication skills to be able to express their ideas. While the other designers can present a sketch to show the Director what they are thinking, the Sound Designer often has to describe it, before they can demonstrate it. Sound Designers can start as re-recording mixers, then move on to becoming Sound Editors. They need an encyclopedic knowledge about sound, including how it affects emotions. Sound Editors, and Sound Effects Editors, take the numerous sonic elements that have been provided and put them together, matching them perfectly to the visual. The quality of the final mix and edit can only be as good as the original material provided. For every sound element, someone had to record it. One important job is ADR (Additional Dialogue Recording) Mixer, who records actors speaking in the post production. When they utter the classic line, “We’ll fix it in post”, they are almost always referring to a dialogue sound problem (eg external noise over a take) and are running out of time in the day. That is because of all the post fixes, getting an actor in to repeat dialogue, is the easiest thing – and some number of ADR days, also known as “looping”, are always included in the contract. However, the performance is rarely as perfect or fresh as the original performance – in part because the actor is standing, in their own clothes, in front of a mic looking at a screen shot of themselves, instead of interacting in a full scene. The Production Mixer will try to minimize the need for looping as much as possible, because that preserves the integrity of the performance, and saves the production money. The ADR Mixer should try to duplicate the performance conditions – such as the type of microphone and levels – as much as possible. For sound effects, the first layer is Foley. A Foley Artist creates a heightened version of every noise that is motivated by the actor’s action on screen. They recreate footsteps on various surfaces (actors who are walking and talking should be walking on carpet or soft surfaces to avoid noise over their dialogue), they recreate knocks, water filling a glass and the click of the glass being set down on a table, the sound of broken bones, tinkling bells, squeaking windows, and even kissing. They break down the script to gain an understanding of every scene and watch the footage to plan their work. The creativity of a Foley Artist comes in finding the right combination of materials to create the desired sounds. I remember one of my friends going on a lengthy search to find just the right pair of heavy workboots for one scene. And there is a sound recordist mixing each of these foley sessions. Sound effects might be created by mixing together unusual recorded sounds. I remember someone talking about a monster’s roar being a combination of a couple of animals and the sound made by hitting a high-tension wire. Effects libraries exist, that may be tapped just as stock footage can be used. Some sound effects are created on computers, and computers have certainly sped up the process of editing sound, just as they have with picture. Meanwhile, someone is composing the score, which will most likely be played by musicians and recorded and mixed by specialists in that field. Someone else could be working hard on licensing existing music for the soundtrack, either as score, or as realistic elements in the soundscape, like someone playing a radio. The entry level positions for post-sound are similar to that of picture Editor. Work as a logger, general PA, or cable wrangler for a post-sound house. There are certainly degrees that are helpful in learning the tech of post-sound. People working in post-sound are often introverts, especially editors, who enjoy being isolated with their computer screen and tech, have great attention to detail. There is an old saying, you don’t often notice good sound, but you sure notice it when it is bad.